Working out at home can be a chore, especially if you don’t have a ton of space to store a power rack or use a lot of exercise equipment. This doesn’t mean that you need to spend a lot of money every month for a gym membership though – there are plenty of compact exercise equipment options that you can use regardless of the amount of space you have. Let’s take a look at some of the best compact exercise equipment that you can use regardless of your skill or fitness level. As well as some compact cardio equipment to help you get your heart pumping. Convenience – You never have to worry about making it to the gym before it closes if you’re working out at home – or having to use public gym showers if you’re working out before heading to work. Everything you need is right there in the comfort of your own home. Cost – Once you get past the initial cost of purchasing your equipment (which can be mitigated slightly by purchasing some of it secondhand) training at home saves you money on gym memberships and fuel to travel back and forth to the gym. Plus, you won’t be tempted to buy one of their overpriced protein smoothies. No Distractions – If you’re at home working out, you don’t need to worry about other people and what they might think of you. You also won’t get distracted by other people going about their workouts, which can happen in gym setting. No Limits – Most gyms have a minimum age limit to use their equipment – and some may have a maximum age limit as well depending on the health of the user. There are no limits when you’re working out at home. No Ego – You’re not trying to impress anyone when you’re working out at home, so you can focus more of your energy on getting good results and less of it on impressing other gym-goers. Customization – When you work out in a gym, you’re limited by the equipment that the gym has purchased, and might not find everything that you need to meet your goals. Purchasing your own compact workout equipment means that you will have exactly what you need for your perfect workout. If you don’t have the time or the money to spend on a gym membership, working out at home is a great option. What do you need to consider before purchasing small exercise equipment for your home? Space – How much space do you have to exercise, and how much space do you have to store exercise equipment when it isn’t in use? This is the primary thing that will determine what equipment you buy and the kind of training you are able to do in your home. Goals – What are your overall goals? Are you trying to lose weight, tone your body, or build muscle? The equipment you purchase will vary depending on your ultimate training goals. You aren’t relegated to outdoor cardio exercises if you don’t have a lot of space in your home. There are plenty of compact cardio equipment options that you can use to get your heart pumping without taking up too much space. Traditional treadmills take up a lot of space, but that doesn’t mean that you need to head outside of you prefer to walk or run for your cardio exercise. 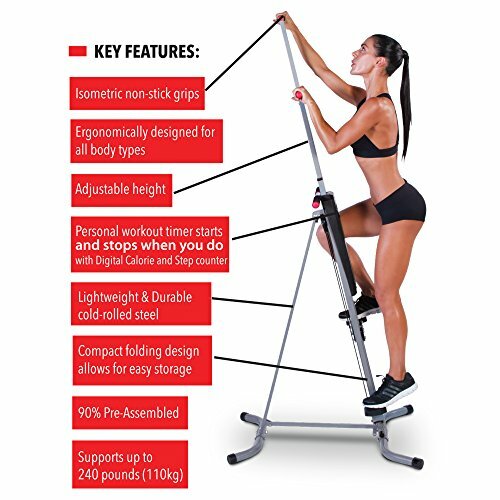 A folding treadmill can be a great alternative. 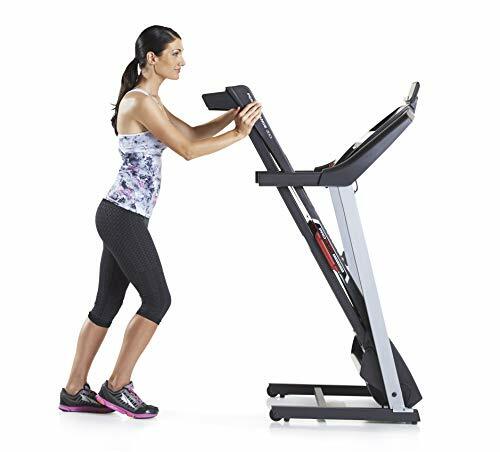 The Pro Form Performance 300i treadmill features a 16 inch wide running surface and a total belt length of 50 inches, making it suitable for a number of different stride lengths. It may look like a full sized treadmill when it’s ready to be used, but when its not in use the running surface folds up, reducing its total footprint to only 35 inches. With 16 on-board workouts and a variety of speed and incline combinations, this folding model does everything that a traditional treadmill does in a fraction of the space. If running isn’t your thing, there are options available for you. 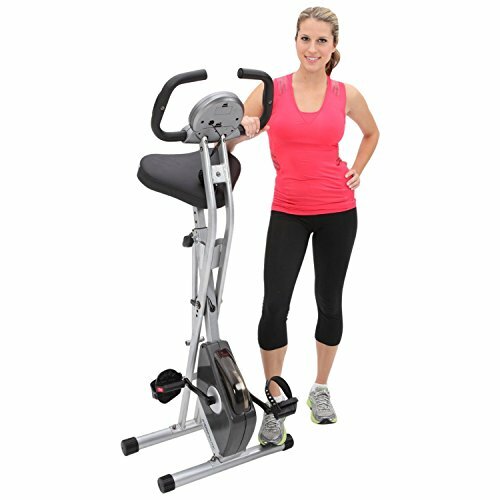 A magnetic folding upright bike can give you a comprehensive cardio workout without needing to drag your bicycle out of the garage. The bike linked above uses magnetic torsion to provide varied levels of resistance, and can easily be adjusted for riders from 5’3” to 6’1”. When you’re not using the bike, it easily folds up to half its previous size for storage. This compact bike includes all the features of a traditional air bike, like heavy duty construction, heart rate sensors and a LCD display to let you keep track of your miles and calories burned. If you don’t have the space to leave a bike out when it’s not in use, just fold it up and store in the corner or the closet until your ready to ride again. If you don’t have a ton of space to store a variety of different equipment, then a single machine that can offer a full body workout might be the best option for you. 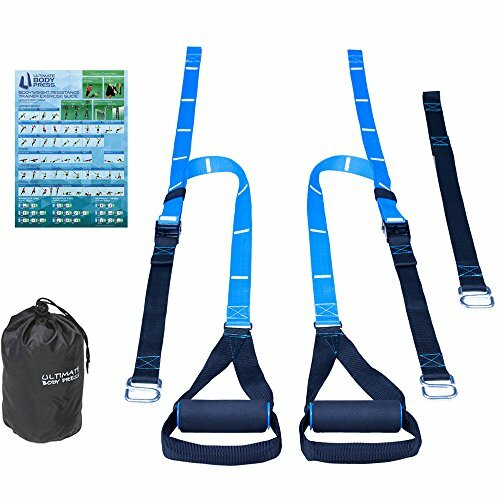 The Maxi Climber gained some popularity due to it’s infomercial, but it does offer a full body cardio and muscle toning workout by allowing you to mimic the movements used in rock climbing in the comfort of your own home. This isn’t a good option for anyone who is trying to build muscle or is already in good shape as it doesn’t have any tension adjustment options so you’re working against your own body weight. It is a useful piece of equipment if you’re short on space though. When not in use, it folds down flat so you can easily store it in a closet or under another piece of furniture. If you don’t even have the room to store a folded up treadmill or recumbent bike, we’ve got one last option for you – a Min Cycle Bike. 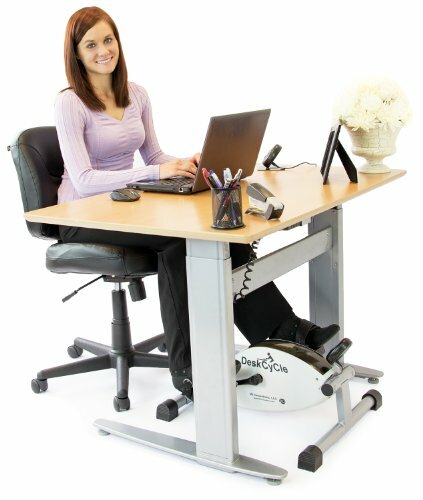 This rests on the floor under your desk or in front of your sofa and allows you to pedal while working on other tasks. With eight different resistance settings, this mini bike can be beneficial for a variety of different people regardless of their fitness level. It is also designed to be much quieter than your standard upright exercise bike so you can even bring it to work with you and pedal under your desk without disturbing your coworkers. If your desk is 27 inches or higher, this little piece of equipment is the perfect fit – it only stands 10 inches high! Now that you’ve gotten your daily cardio exercise out of the way, it’s time to move on to strength training. Benches and traditional strength training equipment takes up a lot of space. Even a basic single bar weight bench has a footprint of 64.5” x 47.5”. Thankfully, you have a lot of options when it comes to strength training and exercise equipment that won’t take up a lot of space. Let’s take a look at some of the best options on the market right now. Getting a barbell or enough dumbbells for a comprehensive workout can take up a lot of space – especially if you have two of each dumbbell from the lightest weight on up. Adjustable dumbbells can get rid of a lot of that clutter. 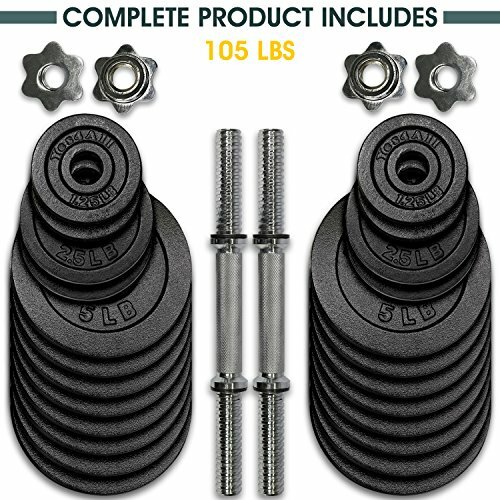 This style of dumbbell, like the one linked above, works like a bench press bar in that you can add or remove weight depending on your needs at the moment. You don’t need multiple dumbbells when you can get anywhere from 2.5 pounds to 52.5 pounds out of a single dumbbell. These also come in a variety of weights, depending on your needs. If 52.5 pounds sounds like it isn’t enough per dumbbell, you can go up to 100 pounds per dumbbell, or down to 20 each. When you’re done, simply put all the plates back on the bar and store them until you need them again. 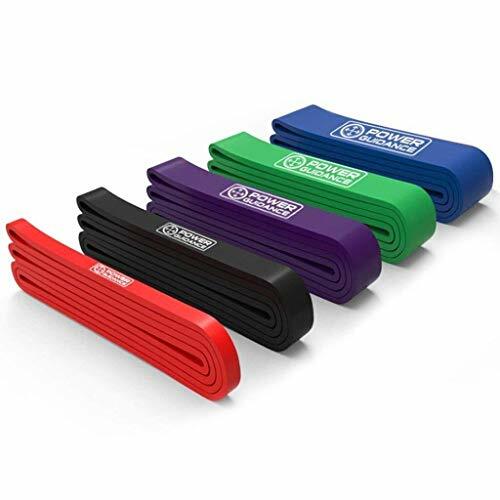 Resistance bands might look like toys but they can be a valuable tool for strength training and toning if you don’t have a lot of space to work with. Each band can offer a variety of different resistance levels, depending on how many times it has been folded over. These bands can also promote better range of motion throughout the exercise because every part of the exercise has resistant rather than just letting your dumbbells or other weights fall to the floor. As an added bonus, these can also be used to help improve upper body strength if you’re working on pull ups. Slinging one over a pull up bar can help offset some of your body weight until you strengthen your arms and can complete pull ups or chin ups unassisted. A full set of resistance bands can easily fit in a draw or on a shelf when not in use. You don’t need a bunch of extra equipment just to do pull ups, chin ups and other upper body exercises. All you need is a pull up bar and a doorway to install it in. The bar linked above is designed to be easily moved from one location to another, making it perfect for a variety of different upper and lower body exercises. The bar itself can expand to fit doorways up to 40 inches wide. The mounting caps can be screwed into any doorway with minimal damage to the woodwork, and can support up to 300 pounds. Even if you don’t have the upper body strength yet to do pull ups, this can be a great tool to help you work up to those upper body exercises. When you’re done, pull down the bar and stash it in a closet until you’re ready to use it again. A lot of at-home exercises are body weight based but that doesn’t mean you’re limited to push-ups, crunches and squats. Anywhere you’ve got an overhead beam or branch that can support your weight, you can use a suspension trainer. You can even used a closed door to support your trainer while you work out. Use this piece of equipment to augment your traditional bodyweight workouts and help you get more out of them. If you’re not familiar with suspension training, the set linked above even includes an illustrated workouts list and some sample workouts to help you familiarize yourself with the equipment. When you’re not using it, the trainer fits in a handy storage bag and can be stashed in a corner or closet until you need it again. This piece of equipment gets a lot of flack because it spent a lot of time in the “As Seen on TV” section but it can be a fantastic tool if you don’t have a lot of space but want to strengthen your abs or core. 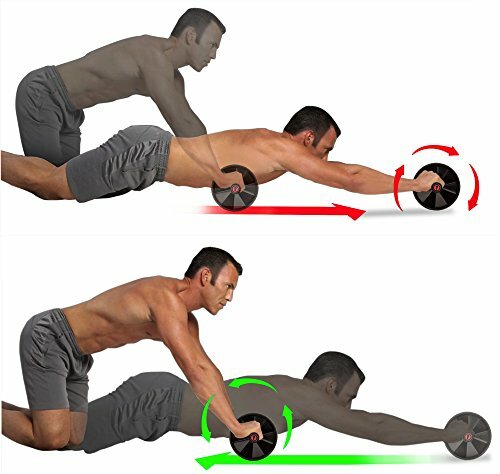 Instead of laying on your back to do crunches which can be painful for some people, the Ab Roller lets you tone your abs by engaging your core to roll forward with your hands on the padded handles of the Roller. This is a very specialized piece of equipment in that it only works your core muscles, but it can be a great option if you don’t have a ton of space. It’s small enough to stash in a closet or on a bottom shelf when not in use. This piece of equipment might make you nostalgic for your schoolyard days but a jump rope can be a great tool for cardio exercise. 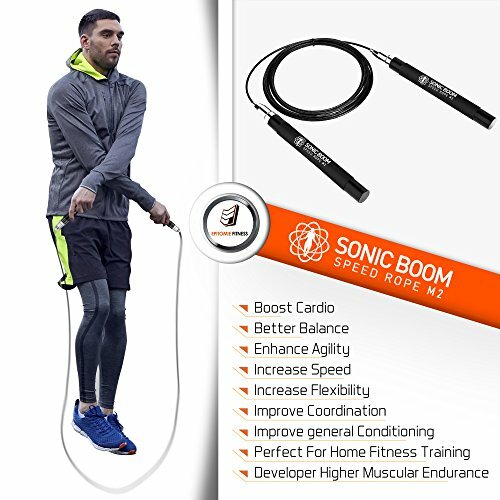 A jump rope like the one linked above is ideal for all sorts of exercises, and can be done indoors (if you have a high enough ceiling) or outdoors, depending on your needs. A jump rope also takes up very little space when not in use. Whether you’re just using it to get your heart pumping or are including jumping rope in your Crossfit or HIIT workout, you should absolutely have a jump rope in your home. Having limited space doesn’t have to limit your workout potential or the gains that you can achieve. There are plenty of options available for both cardio and strength training that take up very little space when not in use and can be stored nearly anywhere. Don’t let your home’s square footage affect your workout.